Pmd’s, Yellow Sallies, Blue Quills, Terrestrials and of course Mr Caddis have been on the menu in abundance. Fishing has been best from early afternoon through dinner and then again for the magic hour as seasonal flows continue to drop closer to 300cfs. The boats will be off the ranch section (Edwards- Wolcott) this week due to water levels, leaving this very special stretch of water to the wade fishermen…..enjoy. 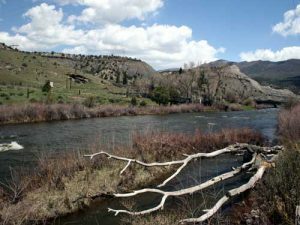 The lower River below Eagle- the Confluence is also fishing very well with some of the same food sources. This stretch can be water temperature sensitive so try and stay away from the heat of the day. This is one of the best places on the Eagle to find some space to your self and have the opportunity at some of her big resident browns. The upper reaches above Minturn- Red Cliff have turned on this week. As water levels continue to drop we have access to more and more of our favorite spots on our headwater stretch. The attractor dry fly bite has been on here and we are anxiously awaiting the arrival of our summer golden stone hatch. Flies: Nymphs: 20 incher and other stones #6 – #14, barr bwo emerger #18 – #22, soft hackle and other pheasant tails #18 – #22, killer mayfly nymph #20 – #24, rainbow warriors #16 – #20, caddis pupa and graphic caddis #16 – #20, serenstupidity #16 – #20, sunk spinners #18 – #24, psycho princes (numerous colors) #16 – #20, biot midges #20 – #22, soft hackle and guides choice hare’s ear (natural and olive) #16 – #20, formerly prince #16 – #20, merc flashback and sparkle wing RSII #18 – #24, soft hackle bwo #20, medallion midge #22 – #24, biot bwo emerger #18 – #22, micro may #18 – #22, jujubee midge #18 – #22, jujubaetis #20 – #22, soft hackle emerger #20 – #22, midge larva #20 – #24, uv midge #20 – #24.